At Dorner, we can provide anything from a single conveyor to a full system. Recently, Dorner worked with a company making frozen pizzas to create a completely custom system with a total of 71 conveyors! 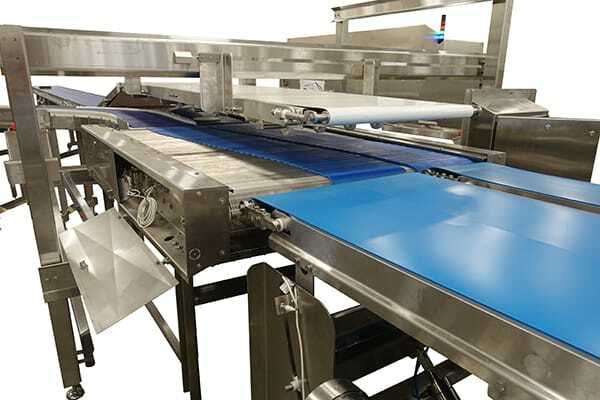 The conveyors needed to take multiple sizes of pizzas through and between processes such as freezing, wrapping, inspection and more. See part of the system in the application video and then read more details on the individual processes below. 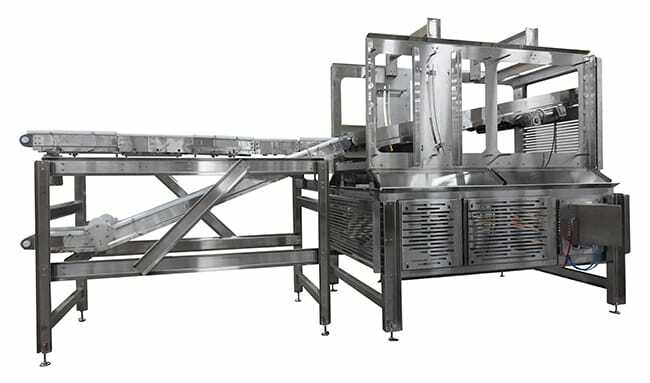 The first Dorner Conveyor in the system feeds the pizzas into a spiral freezer after the raw dough has been topped with the sauce, cheese, and toppings. Because the pizza dough is not frozen yet, there were obstacles with handling the product such as the need for tight transfers and not being able to use guides. We faced a challenge moving the 16” pizza into the freezer since we could not guide through conventional means. To solve this issue, we created an adjustable offset indeed section. When running all sizes except for the 16”, this will function just like a straight conveyor. But for the 16” pizza, we can move a short section on the infeed of this conveyor over to create a small S-Curve Conveyor. 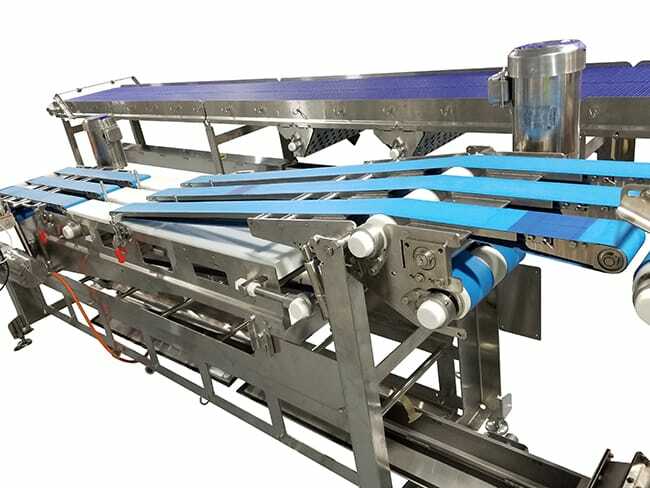 Moving the conveyor into the S-Position is simply done by removing a set of pins, sliding the section over, and then re-inserting the pins into the proper stop location for the offset. The next part of the project was the most complicated. The process takes the pizzas from the discharge of the Spiral Freezer, places a cardboard insert underneath and gets the pizza into the Wrapper. Pizzas come out of the freezer side-by-side and run straight through the Pre-Switch set of Servo conveyors without any adjustments. Pizzas pass through the 1st switch, the Dual Lane Pivot Conveyor, and the second Switch. 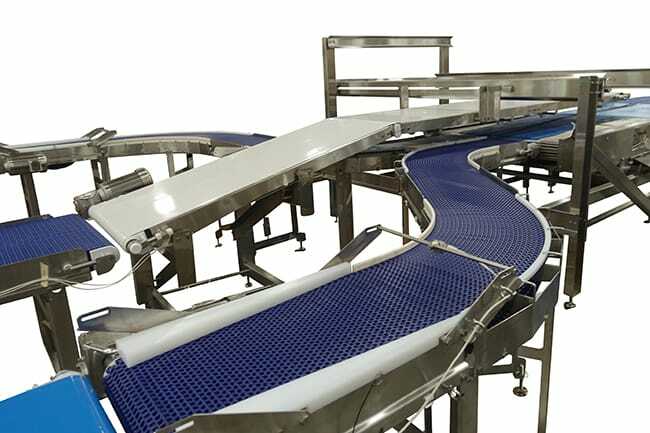 Pizzas enter the S-conveyors with a common infeed where they are splits into two single lanes. Pizzas receive a cardboard circle from the Circle Placer units. Pizzas are fed into the customer’s Wrapper unit. There are two wrappers on this system, each handling 85 pizzas per minute. We needed to be able to accommodate a scenario where 1 or both wrappers are down. To do this, we utilize a Switch Unit that allows us to merge 2 lanes of pizzas into a single lane. We can then direct that single lane of pizza to the appropriate wrapper. The Wrappers or other equipment downstream may be non-functional for maintenance or non-planned situations. 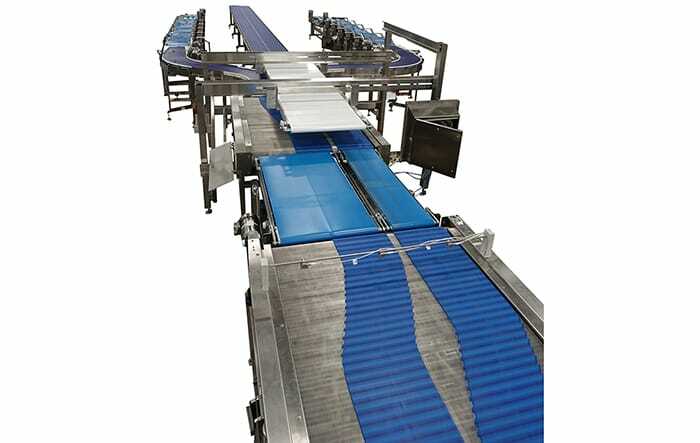 If a Wrapper goes down, the related lane of the Dual-Pivot Conveyor will pop-up. This re-directs the right-hand lane of pizza’s to a conveyor mounted above the 2nd switch, rather than continuing onto the 2nd switch. 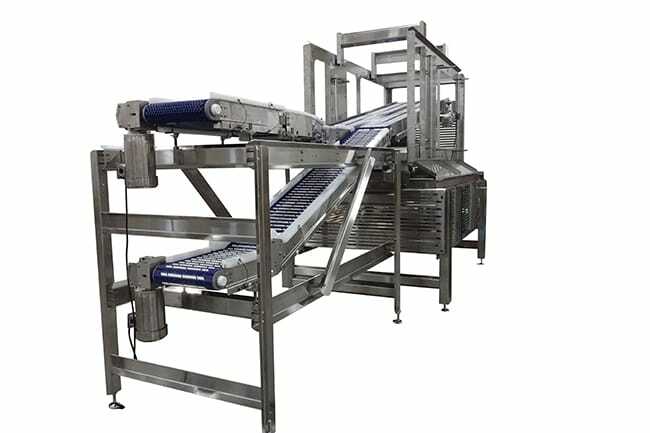 Dual Lane Pivot Conveyor (on right) in flat position Each conveyor is capable of pivoting up independently or in unison. 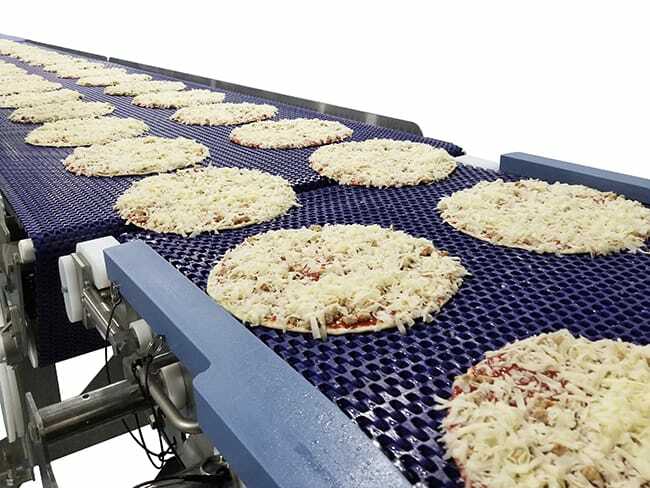 The pizzas on the upper conveyor will continue down to a long Buffer Conveyor in the center of the system while a merge process takes place (lasting approximately 15 seconds). During this time, the currently operational wrapper is still receiving pizzas. The merge process uses the Pre-Switch Servos to stagger pizzas so they can form a single lane on the first Switch Unit. Once the Servo’s have made the proper adjustments, the Pivot Conveyor will return to flat and pizzas no longer travel to the Buffer. The second Switch Unit will then direct the single lane to the currently functional lane. Once the non-operational side is back up and ready to receive pizzas, the merge process will end. We will stop staggering pizzas and everything will run as normal. In the event that both wrapper lanes are non-functional due to downstream equipment, we will pop-up both lanes on the pivot conveyor and continue to send pizzas to the buffer lane until it is full. With this unit we are taking the frozen pizzas at a rate of 85 pizzas per minute and inserting the Cardboard Circle underneath. 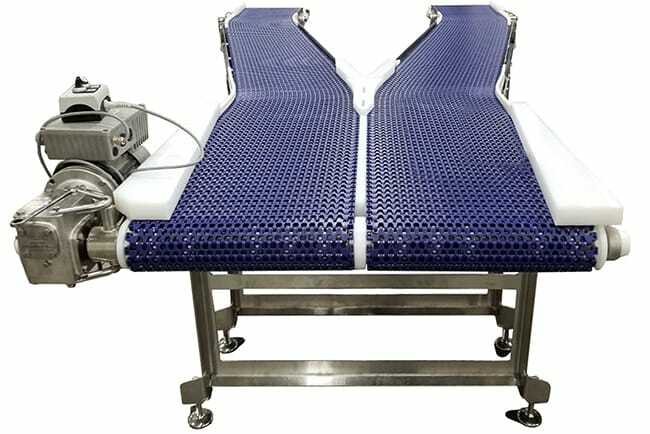 This highly customized conveyor uses advanced cleaning features to meet the sanitary standards required. The 1st and 3rd conveyors pivot up to give more clearance for maintenance/cleaning and feature tip up tails. After the Wrapping Room pizzas continue into the Inspection Room. Here, the labels are added to the wrapped pizzas. Then they go through seal-inspection, metal detectors and checkweighers. This room includes 7400 Curve Conveyors with a common discharge. 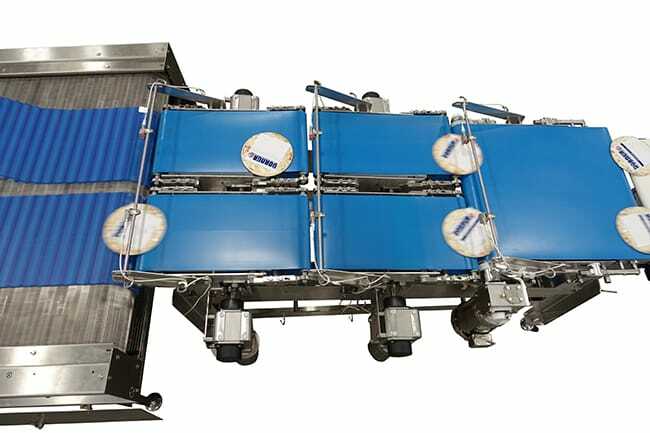 After the Common Discharge Conveyor, pizzas go up an incline and onto a series of long overhead Dorner AquaGard 7350 Series conveyors. These take the pizzas into the Packaging Room. Once the pizzas enter the packaging room, they will take different routes depending on the pizza size. Under normal flow, smaller pizzas will feed an accumulator. However, larger pizzas and pizzas flowing under special circumstances will need to bypass this route. This was accomplished with a large pivot conveyor. This system uses AquaGard 7350s is 32” wide and 11’ long and can pivot to 2 locations. The lower position will go to another special conveyor that feeds an accumulator. The upper position will send the pizzas to 2 additional overhead conveyors. The size of the conveyor ensured we were able to meet the elevation change required and keeps the incline/decline angles to a minimum to avoid pizza’s sliding. 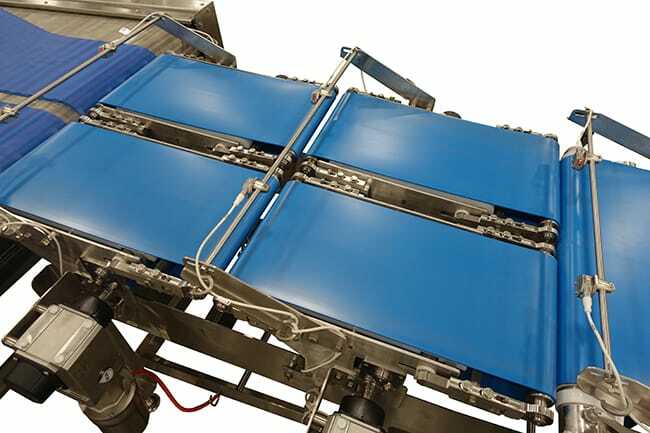 Learn more about Dorner’s Custom Conveyor Systems.